Since 2005 a cross with an outline of a shield has appeared annually on my property in Mine Hill, NJ. 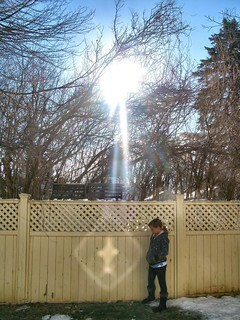 Sunrays are shining on the fence and creating the image of a cross. This image has been showing up every morning since last week. The image appears at the top of the fence and slowly descends until it touches the ground. It then changes into a cricle and disappears. The cross can be seen for about 30 minutes. In John 3:21, it says: "But whoever lives by the truth comes into the light, so that it may be seen plainly that what he has done has been done through God." Interestingly, this is the Lenten season, a time of spiritual renewal for Catholics and many Christians as we prepare for Easter. Jesus said in John 12:46, "I have come as Light into the world, so that everyone who believes in Me will not remain in darkness." My wife had her cousin Diane visit our home with her family on Saturday, March 26th. Her cousin's daughter, Brooke stayed overnight. The cross appeared Sunday morning and she is standing next to the image in awe. Brooke said, "It looks like Jesus." I believe that God has opened the windows of heaven and is pouring out the Holy Spirit on our world. Joel 2:28 says, "...I will pour out my Spirit on all people..."